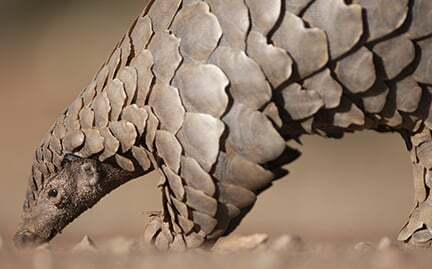 Pangolins are solitary, nocturnal mammals with a full armor of scales. There are eight species, four in Africa and four in Asia, ranging in classification from vulnerable to critically endangered. A startled pangolin hides its head behind its front legs. If attacked, it will roll into a ball, exposing sharp scales on its tail for protection. Increasingly, pangolins are victims of wildlife crime for their meat and scales.